Despite an abundance of information to the contrary, the lowest point in Colorado is not where the Arkansas River flows out of the state (3,350 feet above sea level). Neither is it where the North Fork of the Republican exits (3,337 feet). 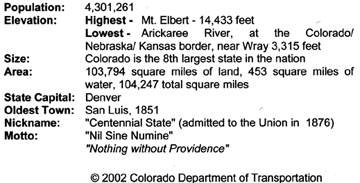 No, the lowest point in the state of Colorado is 3,315 feet: where the Arikaree River flows into the northwest corner of Kansas. This fact was not discovered until 2000, and by then several websites had already published incorrect information. Many of these sites have still not corrected their data, so unfortunately the misinformation stubbornly persists to this day. The following timeline details the information that was available to the public prior to 2000; how Colorado's true low point was located; and some things that have happened or changed since that discovery. 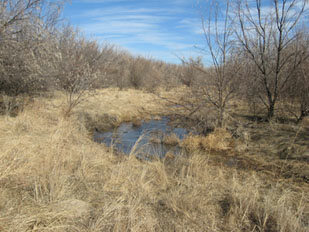 "Near Holly" referred to the point where the Arkansas River flows out of Colorado and into Kansas. It is unknown whether CDoT did their own research, or whether they simply reprinted information that may have already been published by another organization, such as the United States Geological Survey (USGS). 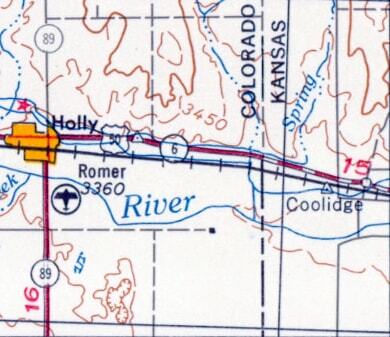 1963: This was the first issue of CDoT's state highway map on which the elevation was changed to 3350', but the location was still described as "near Holly". 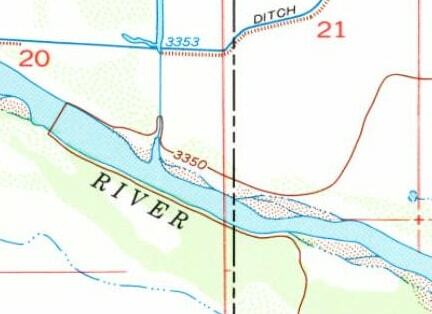 So, based on the 1:250k map series, it is easy to see how someone might come to the conclusion that the Arkansas River has the lowest elevation at the state line. And that is the information that both USGS and CDoT publicized for several years. April 13, 2000: One of Denver's newspapers (the Rocky Mountain News, now defunct) printed a feature called "Wacky Questions", where readers could submit questions to the columnist, who was an expert at tracking down obscure information. On this date, someone wanted to know, "Where is the lowest point in Colorado?" April 28, 2000 (although I did not learn about this until August 2000): there was a discussion on the internet forum "U.S. and World Highpoints". Roger Rowlett, author of the website "America's Roof" (which also contains info on low points, under "America's Basement"), mentioned that he heard the North Fork Republican was lower than the Arkansas. 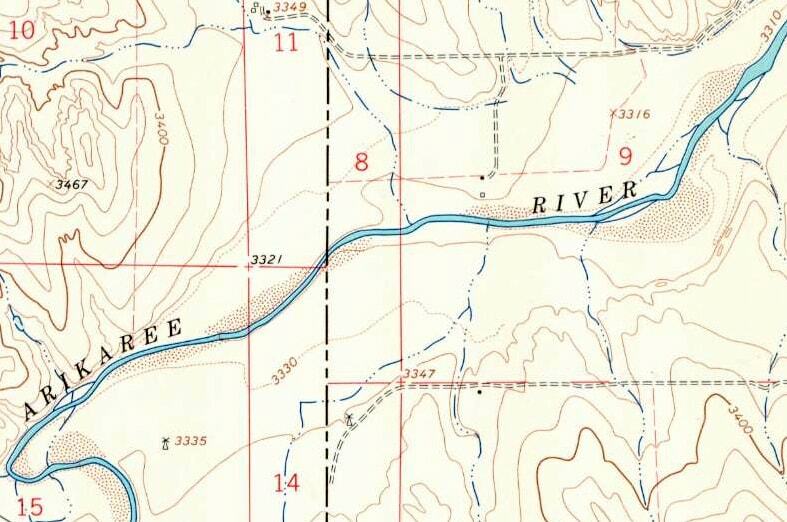 This prompted an investigation on the part of Fred Anderson, who made the same discovery I did: that the lowest elevation in Colorado is where the Arikaree River crosses the state line. May 2, 2000: Jack Parsell, author of a book on lowest elevations, responded to the posts referenced above, and came to the same conclusion. Around this time, he also may have contacted USGS about their inaccuracy (see "October 2000", below). May 15, 2000: The "America's Basement" website becomes the first source to acknowledge the true lowest point in Colorado. June 8, 2000: Adam Roddy went to find the newly-discovered lowest point in Colorado. June 12, 2000: I sent my initial inquiry to USGS, but did not receive a response. August 2000: I finally became aware of the "America's Basement" site and the "U.S. and World Highpoints" forum. I corresponded with Roger Rowlett, who provided some of the information on this timeline. Copyright © 2000 by Central Colorado Publishing Co. All rights reserved. Some of us who live along the Arkansas River have boasted that its drainage includes both the highest point in Colorado (14,433-foot Mt. Elbert in Lake County) and the lowest (3,350 feet, where the Arkansas crosses the Kansas line a few miles east of Lamar). It turns out that we were wrong. We were in good company, since that's what the U.S. Geological Survey has listed as Colorado's lowest point for as long as anyone can remember. It probably came about because someone theorized that the lowest point had to be where a major river (like the Arkansas, South Platte, Colorado, or Rio Grande) left the state, and upon checking those, the Arkansas turned out to have the lowest exit point. Enter Dale Sanderson, a cartographer for Qwest in Denver (small world, though; Colorado Central is produced in a Salida house that we bought from his uncle John in 1989). He noticed that the 1999-2000 official map from the Colorado Department of Transportation listed a new lowest Colorado point. The CDOT low point -- 3,337 feet -- is at the Colorado-Nebraska border, in Yuma County where the Republican River leaves the state east of Wray. Sanderson wondered how that had been missed for all the years, and also wondered if an even lower point might have escaped notice. 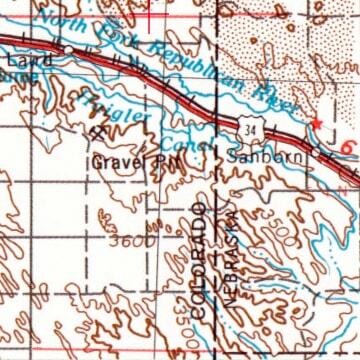 So he delved into the USGS maps, and he found one, also in Yuma County. 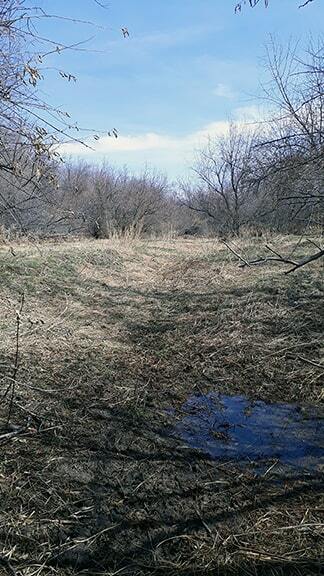 It's at 3,315 feet, where the Arickaree River flows into Kansas (Yuma County borders both Kansas and Nebraska; geographic trivia buffs might take note of Cimarron County in the Oklahoma panhandle, which holds the record for U.S. counties by bordering four states: Texas, Colorado, Kansas, and New Mexico). Both the Republican and the Arickaree rivers have their headwaters out on the plains, and neither is tributary to the Arkansas. 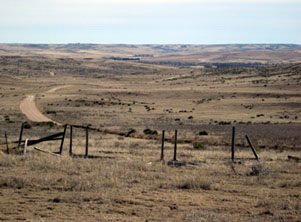 The Arikaree just crosses the northwest corner of Kansas and joins the North Fork of the Republican in southen Nebraska. 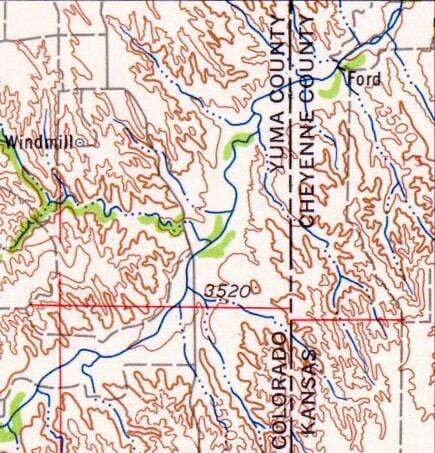 The North and South Forks unite about 30 miles east of that, and flow east, then south into the Kansas River, which joins the Missouri at Kansas City. So Colorado's real low point isn't on Arkansas River drainage, and we'll have to settle for having the three highest points in Colorado (Elbert, Massive, and Harvard) all on Arkansas drainage. We might also note that even though Colorado's lowest point has dropped by 35 feet, Colorado still has the highest low point of the 50 states. The runner-up is Wyoming, at 3,099 feet where the Belle Fourche flows into South Dakota -- or so says the USGS. October 2000: I again contacted USGS about the error, and this time heard back from a couple different people. One was Diane Brittle, who told me that someone else had already contacted them regarding the Arikaree River (see "May 2, 2000", above). She also gave me some information regarding the source of the error (see "1980s" above). July 24, 2001: I checked the USGS page on this day, and I found it had been updated with the new low point... well, sort of: they had the county and the elevation correct, but instead of "Arikaree River", it read simply "Alikaree". I e-mailed a correction and received a reply that it would be fixed. 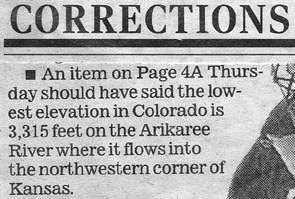 August 6, 2001: The USGS page was corrected to list "Arikaree River" as the lowest point in Colorado. Over the next year, I contacted several government organizations and webmasters, asking them to correct their info. Interesting side note: I later learned that the highest elevation was incorrect as well. Kevin Flynn (another News columnist) informed me that in 2002 the height of Mt. Elbert was revised to 14,440'. September 10, 2005: up until then, the Wikipedia page "List of US States by Elevation" listed the incorrect Colorado lowpoint, but on this date it was corrected, and my webpage was cited as the source. That gives a good feel for what this part of the country looks like in general: virtually no trees, except along the creekbeds. In the distance, a darker area is visible: those are trees lining the valley of the Arikaree River. 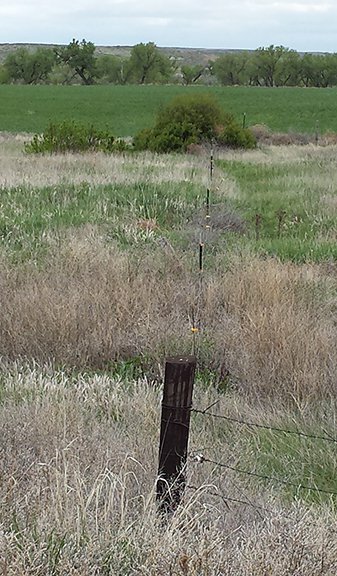 Beyond that are the Arikaree Breaks in the northwest corner of Kansas (this is the same road that provides access to the tri-state corner of Colorado, Kansas, and Nebraska). Travelers can drive pretty much right up to that point, but there is no public access to the lowest point in Colorado. That is the lowest elevation in Colorado. That point holds the distinction of being the highest lowpoint of all 50 states. 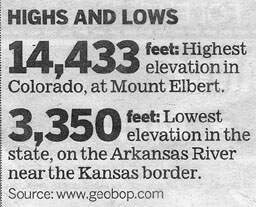 As a matter of fact, Colorado's lowest point is higher than the high points of 18 other states! ​But what is perhaps even more remarkable is the fact that the Arikaree manages to get down to this elevation by the time it exits Colorado... because if one follows the Arikaree upstream, its source is located a few miles northwest of Limon, at an approximate elevation of 5900 feet. 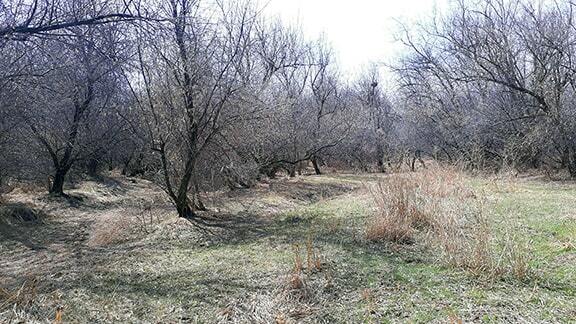 This land forms the western edge of a "table" that is tilted ever-so-slightly to the east. This table sits about 500 feet above both Big Sandy Creek (a tributary of the Arkansas) and Bijou Creek (a tributary of the South Platte). So, how does the Arikaree manage not only to make up that 500 feet, but also to get to an even lower elevation than both of those rivers by the time it reaches the stateline, which is only about 100 miles to the east? Does it pass through land that is perhaps more subject to erosion? That seems like a possibility when one considers that this lowpoint is in an area known as the Arikaree Breaks: a small, scenic region with canyon-like characteristics that can come as a surprise to people passing through here who were not expecting anything other than the level land typical of most high plains locations. last updated Mar. 27, 2019.